This listing is for 1 No. 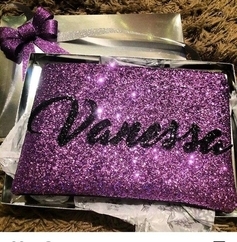 Stunning Chunky Glitter Fully Lined Personalised Name Bag With Zip Fastening. Here is few of our personalised bags we have made for family members and because they loved them so much we decided to try and make a little business out of it....... Don't you agree how stunningly beautiful they are. I will get some more pictures added so you can see how much they sparkle. 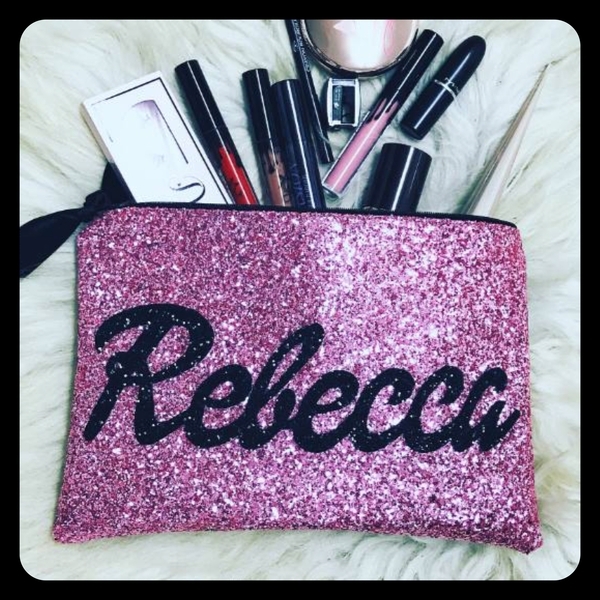 We don't use cheap glitter or glue the bag is all hand made and sewn together. The Glitter Really Adds Sass To This Bag A Real Head Turner. 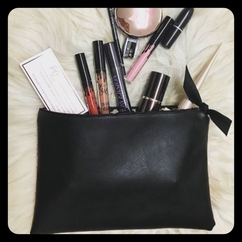 So If You Want To Be The Envy Of All Your Friends And You Like To Have Something A Little Different Then This Is The Bag For You. This bag can be used to store anything from college stationary, medication, sewing, makeup ... the list is endless. Come And Join Our Glam Squad - Be You Be Different! The Bags Are Made To Order And Have A Very Quick Turn Around Time Of A Week (Maximum) Plus Postage Time But Are Usually Posted Within Days. Should You Not Find What You Are Looking For? I welcome Any Ideas That You May Have And Will Be Happy To Work With You And Make It Happen. - The Make Up Shown In The Picture Is Just For Show And Does Not Come With The Bag. - All Personalised Orders (Names) Are Non-Returnable, Unless They Are Faulty. In This Case Please Contact Me Asap And I Will Exchange The Item. Got a question? Message Head Rush By Miranda.